Will Gen Z Have the Last Word in Office Design? Last week, we took a look at some of the layout, technology, and furniture features that Millennials expect in the workplace. They’ll be the dominant demographic for quite some time. However, Gen Z is already jockeying for position in the workforce. In another 15-20 years, their voice will have a great deal of impact on office design. If you are doing long term office space planning, you might want to look ahead and anticipate what this youngest generation of workers wants. According to Haworth strategist Dr. Michael O’Neill, the workplace is already shifting to take the tastes of Generation Y into account. These young people crave social connection, collaboration, and choice. The boundaries between work and life blur as workspaces develop that look nothing like traditional cubicles. Instead, they resemble a lounge, a café, or even a garden. People aren’t supposed to know the precise purpose of each space—it’s all open for interpretation. This takes the flexibility desired by Gen X a step beyond facilitation into complete freedom. O’Neill suggests that this free-for-all is going to shift when Generation Z reaches the workforce in meaningful numbers by 2020. He has some interesting ideas about why this is so (it may have to do with being raised by Gen X parents), but the impact on the office could be significant. Instead of thriving on chaos, they may want spaces that are clearly defined. When they show up at work, seeing a layout that makes it easy to understand what type of activity takes place in each area may help them be most productive. Having choices will still be important, but ‘legibility’ of space (O’Neill’s term) could prove essential. With so much uncertainty and speculation, is it really possible to make long term plans for the office? According to workplace design expert Despina Katsikakis, there is a way to future proof your workplace. She takes the view that adaptability will need to be designed and built at the overall facility level and the office level. In her ideal scenario, “Space could be adapted for business shifts in ‘real-time’ and be continually re-aligned with core business objectives.” She sees workspace as being event driven, with a high level of dynamism and a focus on user choice and control. Generation Z won’t be the last generation to want to work in new ways. In the end, having the agility to shift with the trends (rather than finding one perfect layout), is the key. Let The Office Planning Group help you envision the most flexible way to use your space now and for the future. It’s not surprising that employers often struggle to keep up with changing expectations for workplace design. The goal posts keep shifting with each generation. That’s been especially true for the millennials. This generation came of age during a profound shift in how technology is used for commerce. However, the oldest workers in the millennial generation have now reached their early thirties—and they’re old enough to have their minds made up about what they want and need in a workspace. Since they are likely to represent 3 out of 4 workers in the U.S. by 2025, their opinion certainly matters. First, let’s be clear that young workers don’t see the workplace as an expendable environment. According to research from CBRE Group, Inc. young professionals don’t really want to be at home all day working in their pajamas. About 4 out of 10 prefer to work mainly from a single office location. Another 50% like the option to work from the office or from home. Only 7 out of 100 want to work mainly from home (and even they would probably change their minds if that was their only option). Provide a mix of work environments to choose from within the physical office space. These employees appreciate autonomy and expect to be trusted to know when, where, and how to get their work done most effectively. Ensure consistent and secure remote access to business data, apps, and networks. Millennials want to be mobile and expect business technology to support them. Make space for face-to-face teamwork. Self-directed and impromptu meetings are common among younger workers who typically spend less than 50% of their workday at their individual desks. Select mobile office furniture that can be reconfigured by employees throughout the day as-needed. Coming in to the office each day is a lot less boring when the layout is fluid. Add ergonomic furnishings to enhance workstations. Millennials don’t care about having a big desk. They do appreciate having an articulated monitor stand so they can easily adjust a shared workstation to their needs at a moment’s notice. For a full-scale review of your office space with the needs of the emerging workforce in mind, contact TOPG today. Are You Fascinated by the History of the Modern Office? You’re not alone. The development of the modern office is a topic that’s fascinated a lot of researchers and writers over the years. Today, working a 9 to 5 job in a cubicle is so mundane that most people don’t stop to think about how this whole lifestyle came about. We tend to think of globalization as a fairly recent phenomenon in business. But one of the first purpose-built offices, and certainly the largest of its era, was devoted to international commerce. The East India Company was the hub of Britain’s commercial empire in the 1700s and 1800s. Generating, managing, and filing business correspondence required all hands on deck. It was the ‘paper-full’ office. The East India House had so many employees that management felt the need to institute a tracking program. At one point, they forced clerks to sign in and out—and to sign that they were present every 15 minutes. The BBC’s Lucy Kellaway recounts the details of office life in that era in her production “Beginnings of the Modern Office”. Saval is more of an optimist, believing that it’s time to start viewing the office itself as something quaint and outdated. He sees a future in which office buildings will be shuttered forever as workers go out into the world. While offices are probably not in immediate danger of extinction, they are certainly not the prisons they once seemed. Certainly with the right space planning and furnishings, they can now be a place where workers choose to go to be productive–even if they have the option of working elsewhere. For ideas on how to make your office space inviting, contact The Office Planning Group for a no-obligation consultation. What Elements of Office Design Impact Daylighting? As you can see, everything from construction to office space layout matters in a successful daylighting project. If you’re considering embarking on this type of renovation, let us play a role in helping you uncover the hidden potential for daylight in your office. This might involve rearranging furniture, lowering cubicle wall heights, and much more. 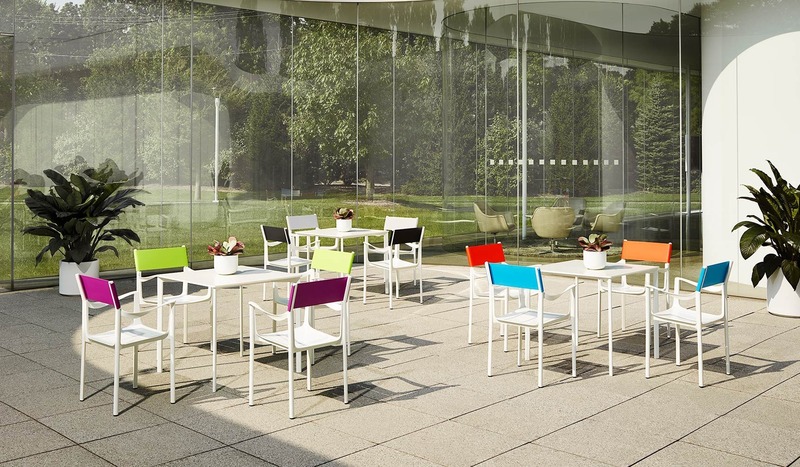 Are You Designing an Outdoor Office? Is an outdoor office in the future for your company? It might be if designers like Jonathon Olivares have anything to say about it. The mobile work trend has opened up many new buildings as potential workspaces. Employees may find themselves at a café, a coffee shop, a library, or even a shopping mall, checking email or performing other work-related tasks. Many of these facilities now expect that people will be using smart devices or laptops on-the-go and provide power outlets, charging stations, Wi-Fi, seating, and low worksurfaces to support these activities. But one massive space that’s been largely overlooked as a potential work zone is the great outdoors. In temperate regions of the United States, an open air office might attract a great deal of interest. That’s a future that Olivares has envisioned in some detail in his recent installation “The Outdoor Office”. The artistic 3-dimensional experimental models for this exhibit were featured at NeoCon 2013 and reside at the Art Institute of Chicago. The architectural components and office furniture for the al fresco workspace were conceived with inspiration from a very wide variety of sources in both the entertainment and office design communities. While the idea of an outdoor working environment was originally met with disbelief by one of Olivares’ clients, the designer held firm to the notion that this future would become a reality. In fact, it’s already become common to see people working outdoors in good weather, making use of park benches, picnic tables, or whatever furniture is at hand. It isn’t much of a stretch to imagine offices taking advantage of their own outdoor real estate. Front lawns and landscaped areas could be equipped as flexible workspaces with furnishings that support focused work, collaboration, education, socialization, and presentation. 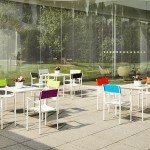 Companies like Herman Miller and Knoll already have extensive collections of furniture that support work outdoors. Knoll’s line even features chairs by Olivares himself. Companies seeking to expand outside need to think about providing shade structures, orienting the partially covered workspaces to catch the breeze, and ensuring all materials can withstand local weather conditions. An outdoor office in New Orleans might need mildew resistant materials and additional ventilation to cope with humidity. However, the benefits of increased outdoor access for improving mood, creativity, productivity, and satisfaction for employees might be well worth the investment.